These are among the toughest bags we carry. Made of a UV-resistant polyethylene monofilament, they'll last for years and stand up to tough abuse. We've driven over a gravel-filled snake bag with a 15-ton front loader with no bursting or damage to the bag. Empty size is 11"x48"; filled size is about 6"x36". These are ideal for filtering out sediment around stormdrains & downspouts, diverting water flows, and ballast. They can be used time after time; empty them out, hose them down if needed, let them dry & stash them in the shop, the garage, your toolbox or behind your front seat. They'll be ready when you need them. These bags are slightly open weave. Fine fill (sand, silty dirt) may sift or wash out over time. For filtration, fill with pea gravel, compost, woodchips, or other selected media. 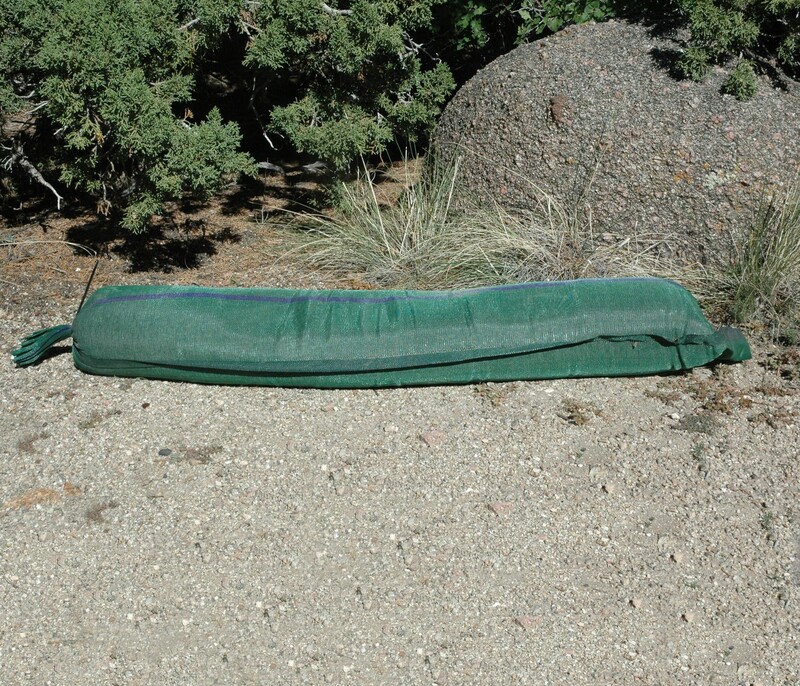 If using lightweight media, you may want to mix with rocks or gravel to add weight so the bag will stay put, or else tie/stake the bags into place. You can securely zip-tie the opening; the other end is heat-sealed to resist rupture, and features a flap that can be staked or used for a handle which makes them easy to carry and deploy. Filled weight with gravel will be about 50-60 lbs.